I received my tree yesterday, looks good, smells great - but I was dismayed to see the delivery bloke just dragging the tree along the concrete all the way up my long driveway by the base - really? A bit more care by the guys delivering your beautiful trees would be good. My first Christmas tree in Australia, the delivery is really good and tree smells amazing. it was a good experience here in Australia to receive my first tree online. I must say the service is amazing with a phone call and friendly staff. 5 stars from me. Beatuiful tree and smells good. I've been ordering trees from this website for 2 years now and the service gets better every year. Thank you for making it easy. 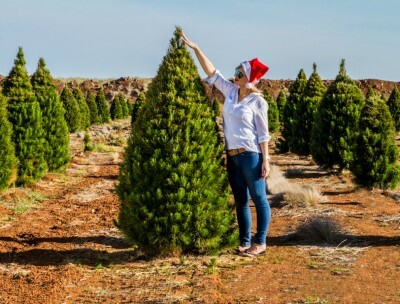 Best ever christmas tree service in Melbourne. I have been ordering real christmas trees for years from other suppliers and yet this service has been the best experience for me plus the Christmas tree is stunning! I gave 4 stars only because delivery time was late a few hours. The serves was just so great that I had to leave a review. From the time of order, I had communication. Received an email with an estimated time of arrival and GPS link. The driver called me before their arrived and tree is just stunning! This is the best online service I have ever received. Thank you and Merry Christmas to all. I was very happy to find this service online. Being from overseas I did not know where to buy a real christmas tree. The man on the phone was very polite and helpful and the delivery was easy. Now it is my first Christmas tree in Australia and I am very happy. Merry Christmas to all. Fresh tree and excellent customer service. The thought of getting a Christmas tree delivered to my home seemed like a great idea. Unfortunately the delivery was late by a few hours and I ended up waiting anxiously. When the Christmas tree arrived, it was one of the best fresh Christmas trees I have had. Was it worth the wait? It is a personal choice, next time I will only get it dropped off and avoid the wait, then I would give 5 stars. © 2014 - 2019 Real Christmas Trees Melbourne (PF & FR Pty Ltd). All rights reserved.